Note: National income divided by adult population. National income = capital depreciation + net foreign income. However, relatively little is known about how the distribution of income and wealth within China changed over this critical period. That is, we do not have consistent estimates of the extent to which the different income and wealth groups have benefited (or not) from the enormous macroeconomic growth. The household surveys that are used to study distributional issues in China (e.g. Piketty and Qian 2009) suffer from massive under-reporting, particularly at the top of the distribution, and are typically not consistent with the data sources that are used to measure macro growth (namely, national accounts). This is an issue of tremendous importance not only for China and its future development path, but also for the rest of the world and the social sustainability of globalisation. In the current research, we combine official and non-official sources (including independent estimates of China’s balance sheets)2 to provide the first systematic estimates of the level and structure of China’s national wealth since the beginning of the market reform process. We find that the national wealth-income ratio increased from 350% in 1978 to 700% in 2015. This increase was mainly driven by the increase of private wealth, which increased from 115% to 487% of national income during the same period (Figure 3). The share of public property in national wealth declined from about 70% in 1978 to about 30% in 2015. More than 95% of the housing stock is now owned by private households, as compared to about 50% in 1978. 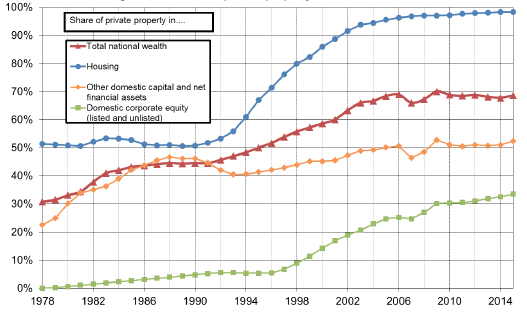 Chinese corporations, however, are still predominantly publicly owned: close to 60% of Chinese equities belong to the government (with a small but significant rebound since 2009), 30% to private Chinese owners, and 10% to foreigners – less than in the US, and much less than in Europe (Figure 4). In brief: China moved a long way toward private property between 1978 and 2015, but its property regime is still markedly different than in other parts of the world. China has ceased to be communist, but is not entirely capitalist; it should rather be viewed as a mixed economy with a strong public ownership component. In effect, the share of public property in China today (30%) is higher than in the West during the mixed economy regime of the post-WW2 decades (around 15%-25%), but not hugely so. 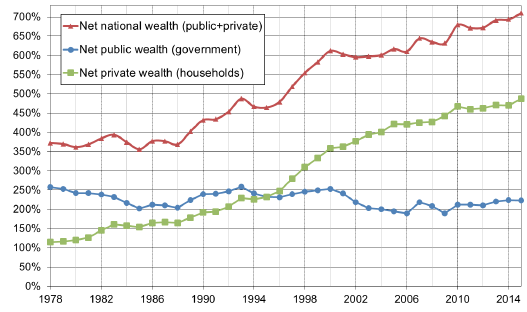 And while the share of public property in national wealth has declined to 0%, or even less than 0%, in Western countries (with public debt exceeding public assets in the US, UK, Japan, and Italy today), the public’s share of national wealth in China seems to have strengthened since the 2008 financial crisis. These findings are not completely unexpected, but we feel that it is important to be able to put numbers on these evolutions. By combining recently released tax statistics on high-income individuals with household surveys and national account data, we can provide new estimates of income inequality (Piketty et al. 2017). 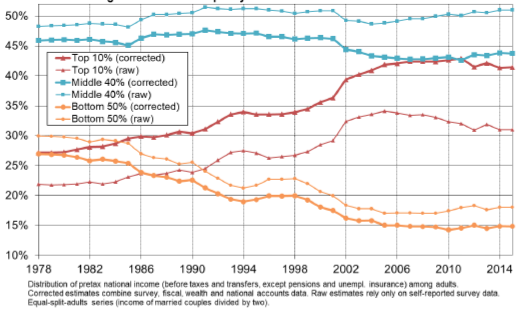 To our knowledge, this represents the first attempt to use tax data on high earners to correct inequality statistics in China.3 An income tax has been in place in China since 1980, but until recently no detailed income tax data were available, and scholars therefore had to rely on household surveys based upon self-reported information. In 2006, the Chinese tax administration began to release data on the numbers of high-income individuals (i.e. with individual taxable income above RMB120 000 per annum, equivalent to €11,988) and their incomes. We should make it clear that these data are highly imperfect; our revised estimates might well under-estimate inequality and our top income shares should be viewed as lower bounds. What is interesting, however, is that even these lower bounds are already a lot larger than official survey-based estimates. For recent years, we find the income share of the top 10% to be around 41% of total national income (as opposed to the 31% suggested by surveys), and the income share of the top 1% to be approximately 14% of national income (as opposed to 7% suggested by surveys). According to our series, the share of national income going to the top 10% rose from 27% to 41% between 1978 and 2015, while the share for the bottom 50% fell from 27% to 15%. The urban-rural income gap increased, but income concentration also rose significantly within both urban and rural China (Figure 5). To summarise, the level of inequality in China in the late 1970s used to be less than the European average – closer to those observed in the most egalitarian Nordic countries – but it is now approaching a level that is almost comparable with the US. 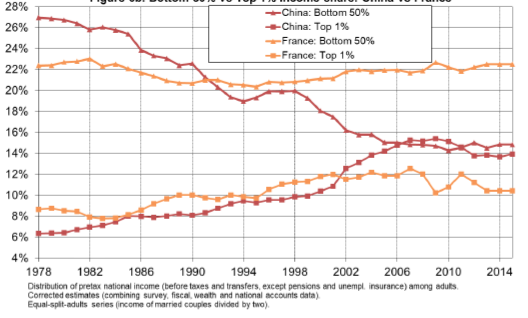 The bottom 50% in China earn approximately 15% of total national income versus 12% in the US and 22% in France; while the top 1% earns about 15% of national income, versus 20% in the US and 10% in France (Figures 6a and 6b). 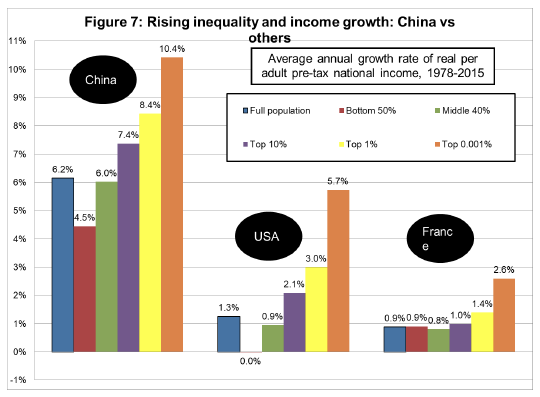 Comparing the average annual growth rate of real per adult pre-tax national income for different income groups in China, the US and France from 1978-2015 (as shown in Figure 7), the top 1% of the income distribution experienced a growth rate of 8.4% in China, 3.0% in the US, and 1.4% in France. However, the average annual growth rates for the bottom 50% in China and the US are significantly lower at 4.5% and 0%, respectively, while the same figure was 0.9% in France. For the time being, China’s development model appears to be more egalitarian than that of the US, but less so than those in European countries. Benjamin, D., L Brandt, and J Giles (2005), "The Evolution of Income Inequality in Rural China." Economic Development and Cultural Change 53(4): 769-824. Benjamin, D, L Brandt, J and Giles et al. (2008), “Income Inequality during China’s Economic Transformation”, in L Brandt and T Rawski (eds), China’s Great Economic Transformation. New York: Cambridge University Press. Cao, Y, H Zhong, S Liao and Q Ye (2012), “Chongsu guojia zichan fuzhai nengli” (Reconstruct the National Balance Sheet), Finance (Cai Jin) 15. Chi, W (2012), “Capital Income and Income Inequality: Evidence from Urban China.” Journal of Comparative Economics 40: 228–239. Gustafsson, B, S Li, and T Sicular (2008a), “Inequality and public policy in China: Issues and trends”, in B Gustafsson, S Li, and T Sicular (eds), Inequality and Public Policy in China, New York: Cambridge University Press, pp. 1–34. Gustafsson, B, S Li, and T Sicular (2008b) “Income inequality and spatial differences in China, 1988, 1995 and 2002”, in B Gustafsson, S Li, and T Sicular (eds), Inequality and Public Policy in China, New York: Cambridge University Press, pp. 36–61. 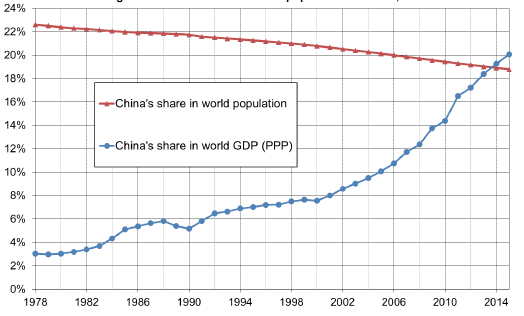 Khan, A R and C Riskin (2005), “China’s Household Income and Its Distribution, 1995 and 2002.” China Quarterly 182 (June). Khan, A R and C Riskin (2008), “Growth and distribution of household income in China between 1995 and 2002”, in B Gustafsson, S Li, and T Sicular (eds), Inequality and Public Policy in China, New York: Cambridge University Press, pp. 1–34. 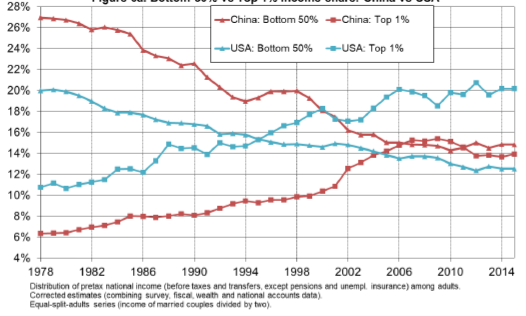 Knight, J (2014), “Inequality in China: An Overview”, World Bank Research Observer 29 (1): 1–19. Knight, J and L Shi (2016), “The Increasing Inequality of Wealth in China, 2002-2013”, Economics Series Working Papers. Li, S, H Satō and T Sicular (2013), Rising inequality in China: challenges to a harmonious society, Cambridge : Cambridge University Press. Li, S and H Wan (2015), “Evolution of wealth inequality in China”, China Economic Journal 8(3): 264–287. Li, Y, X Zhang and X Chang (2013a). Zhongguo guo jia zi chan fu zhai biao 2013 : li lun, fang fa yu feng xian ping gu (China National Balance Sheet: Theory, Method, and Risk assessment). Beijing: China Social Science Press. Li, Y and X Zhang (2013b), “China’s sovereign balance sheet risks and implications for financial stability”, in China’s road to greater financial stability, Washington, DC, pp. 63–78. Li, Y, X Zhang and X Chang (2015), Zhongguo guo jia zi chan fu zhai biao 2015: gang gan tiao zheng yu feng xian guan li (China National Balance Sheet: Leverage Adjustment and Risk Management), Beijing: China Social Science Press. Ma, J, X Zhang an Z Li (2012), Zhongguo guo jia zi chan fu zhai biao yan jiu (A study of China’s national balance sheet). Beijing: Social Science Literature Press. Piketty, T and N Qian (2009), “Income Inequality and Progressive Income Taxation in China and India, 1986–2015”, American Economic Journal: Applied Economics, 1(2), 53–63. Piketty, T and G Zucman (2014), “Capital is Back: Wealth-Income Ratios in Rich Countries 1700-2010”, The Quarterly Journal of Economics 129(3): 1255–1310. Piketty, T, E Saez and G Zucman (2016), "Distributional National Accounts: Methods and Estimates for the U.S.", PSE and Berkeley. Piketty, T, L Yang and G Zucman (2017), "Capital Accumulation, Private Property and Rising Inequality in China, 1978-2015", NBER Working Paper No. 23368. Xie, Y, X Zhang, Q Xu, and C Zhang (2013), “Income Distribution” [in Chinese], in Y Xie, X Zhang, J Li, X Yu, and Q Ren (eds), China Family Panel Studies, Beijing: Peking University Press, pp. 27–53. Xie, Y, X Zhang, Q Xu and C Zhang (2015), “Short-Term Trends in China’s Income Inequality and Poverty: Evidence from a Longitudinal Household Survey”, China Economic Journal 8 (3): 1–17. 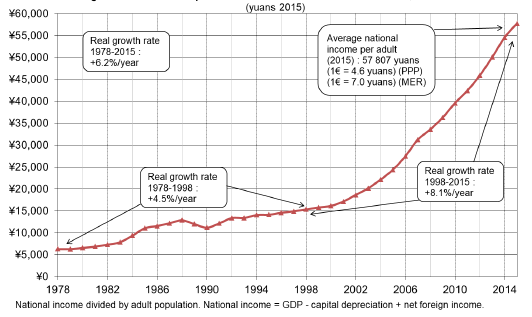 Annual per adult national income rose from less than 6,500 yuan in 1978 to over 57,800 yuan in 2015, i.e. from about €1,400in 1978 to about €12,500in 2015 (these amounts are expressed in 2015 yuan and euros using the latest purchasing power parity estimates). See, for example, Yang et al. (2013a, 2013b, 2015), Ma et al. (2012), and Cao et al. (2012). Previous work on income inequality in China was almost entirely based upon household surveys; see, for example, Piketty and Qian (2009), Benjamin et al. (2005, 2008), Chi et al. (2011), Chi (2012), Gustafsson et al. (2008a, 2008b), Khan and Riskin (2008, 2005), Knight et al. (2016), Knight (2014), Li et al. (2013), and Xie et al. (2015, 2013). Hong Kong and Macao are excluded from our data—both from the national accounts and from the household surveys, income tax returns, and wealth rankings. This could lead us to underestimate the rise of inequality, and this should be taken into account in future research. Piketty, Saez and Zucman (2016) construct distributional national accounts for the United States, and Garbinti, Goupille and Piketty (2016, 2017) for France. These and the present Chinese series all follow the same guidelines (see Alvaredo et al., 2016). New and updated series will be regularly made available on-line on the World Wealth and Income Database (WID.world).